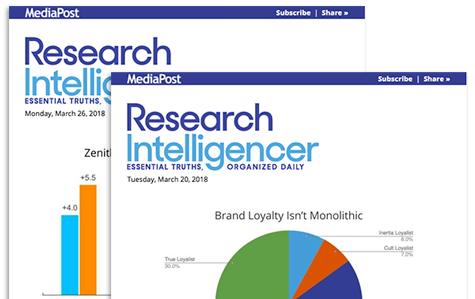 Edited by Joe Mandese and a team of journalists with decades of experience covering advertising, media and marketing ... Research Intelligencer cuts through the morass of marketing intel flooding your inbox so you can focus on what matters most -- and is most likely to move the marketplace. It's called "Research" Intelligencer, because it weeds through the morass of research, data and analytics competing for your attention. But, it's truly about delivering insights and intel that will fuel and/or disrupt the trillion dollar industry so you can focus on getting your fair share. Much of the content is unique, first-look and exclusive knowledge. All of it is organized specifically for busy marketing and media pros who want -- no, depend upon -- information that will give them a competitive advantage. Be the gal or guy who knows something the other people in the room don't know. The world of advertising, marketing and media moves too fast to keep up with every next new thing. Don't be the last one to know which ones actually matter.